SIOUX FALLS, S.D. - For the week ending Sunday, there were 3.5 days suitable for fieldwork, according to the USDA's National Agricultural Statistics Service. Topsoil moisture supplies rated 8 percent very short, 20 short, 65 adequate, and 7 surplus. Subsoil moisture supplies rated 14 percent very short, 29 short, 53 adequate, and 4 surplus. 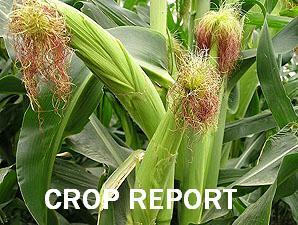 Corn condition rated 6 percent very poor, 13 poor, 20 fair, 41 good, and 20 excellent. Corn mature was 81 percent, well ahead of 49 last year, and ahead of 63 for the five-year average. Harvested was 11 percent, ahead of 3 last year, and near 7 average. Soybean condition rated 7 percent very poor, 9 poor, 26 fair, 41 good, and 17 excellent. Soybeans dropping leaves was 92 percent, ahead of 87 last year, and near 90 average. Harvested was 21 percent, ahead of 9 last year, and near 20 average. Sorghum condition rated 0 percent very poor, 4 poor, 29 fair, 66 good, and 1 excellent. Sorghum coloring was 89 percent, near 90 last year, and behind 95 average. Mature was 37 percent, near 34 last year, but behind 51 average. Harvested was 9 percent, ahead of 1 last year, but near 10 average. Sunflowers harvested was 3 percent, near 1 average. Winter wheat planted was 67 percent, near 63 last year and 65 average. Emerged was 31 percent, ahead of 19 both last year and average. Pasture and range conditions rated 9 percent very poor, 16 poor, 32 fair, 39 good, and 4 excellent.